Instead of being a unifying factor in our society, religion has taken a turn to the right, joining fact-defying Trumpies in an assault against science and reality. Look back at the Medieval Church when it condemned Leonardo da Vinci's work, claiming it was anti-Christian and occult. Accused of black magic, he was forced to leave Italy and seek refuge at the more liberal court of the King of France. Think about that. It is argued that no man has ever studied more subjects or generated more ideas, than Leonardo da Vinci. For centuries the church tried to keep it's hold on it's subjects by denying reality, but science won out, and great inventions carried civilization into the future. Now here we are in the 21st Century, confronted with the same problem people had in medieval times; science versus religion. For reasons often hard to understand, right-wing church-goers have embraced the most unpopular president the United States has ever had. 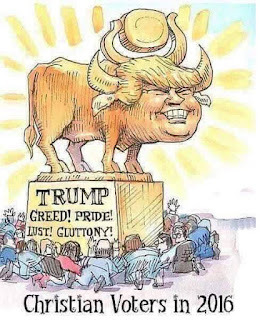 Trump, in turn for the religious vote, has casually violated the Constitution by allowing religion to become politicized - instead of separating the two as described in the First Amendment. Putting the religious vote into perspective, it opens another door by assaulting reality in a time of alt-right "Fake News," and a president who is a habitual liar. Science is being challenged by Trumpies and the church in a joint effort to erase reality. Organizations like Answers in Genesis, believe the Bible's story of creation is historical and not a myth. The organization has even constructed a replica Noah's Ark in Williamstown, Kentucky. Here's the controversy behind the Ark. I believe that's it best for everyone involved to have that separation between the church and politics. Passionate parishioners should follow Jesus's example to seek peace, and to stay away from the politics of rulers. 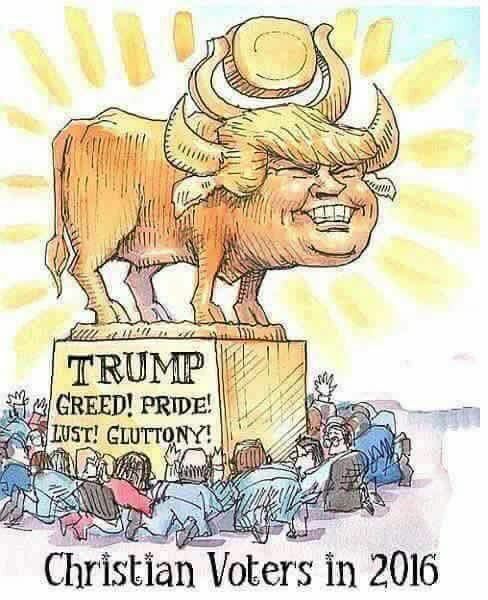 Supporting our Blasphemer-in-Chief just isn't the right path to heaven.